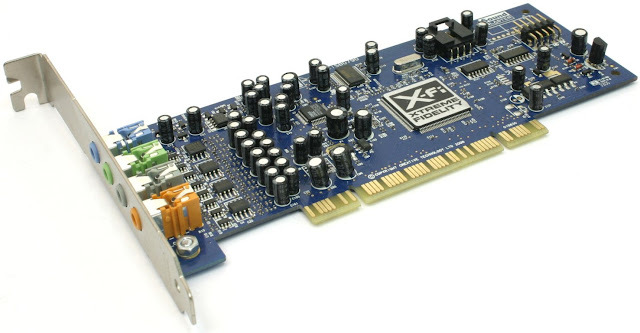 The left channel of my Sound Blaster X-Fi Xtreme Audio sound card decided to die. I carefully smoothed my headset cabling in case a break had developed in the typically very fine stranded wiring of the headphones, and also tried removing the plug with an MP3 playing and noticed that only one channel was being played back, the right with the plug fully inserted, left if I just slightly unplugged it. Just in case I plugged the headphones into my laptop; perfect stereo sound, so something's definitely up with the card. I popped open the computer and examined the headphone jacks on the card. They appeared to be made of plain copper, and they seemed to have oxidation, much like an old penny. I took a flat-bladed screwdriver from an eyeglass repair kit and carefully scraped away at the copper surface, revealing shiny metal underneath, then blasted away any residue with some canned air. Now my music is once again in glorious stereo!